A faulty tank on Riverside Drive leaked more than 50 gallons but did not affect any nearby water sources. AUGUSTA — State officials worked through the day on Wednesday to clean up a small heating oil spill that was discovered by a landscaping crew while working Monday afternoon on Riverside Drive. The spill did not affect any nearby water sources, according to a Maine Department of Environmental Protection spokesperson. DEP spokesperson Karl Wilkins said in an email that 50 to 100 gallons of oil spilled from the basement of a building at 667 Riverside Drive. City records show that the building is owned by G&E Realty. A DEP responder said a faulty line attached to an old heating oil tank caused the leak and issued a recommendation to the owner of the property to replace the tank. Director of the DEP’s Response Division Jeff Squires said he did not receive any indication that a nearby stream or the Kennebec River was affected by the spill. Squires said the Fire Department cleaned up spots of oil on Monday when the spill was reported initially, but it didn’t call the DEP until Wednesday, when more oil was discovered. Responders used Sorbent pads to absorb the oil, Squires said. He said that while the spill was small compared to other oil spills, there is always potential harm to habitats and the environment if oil gets into water sources. 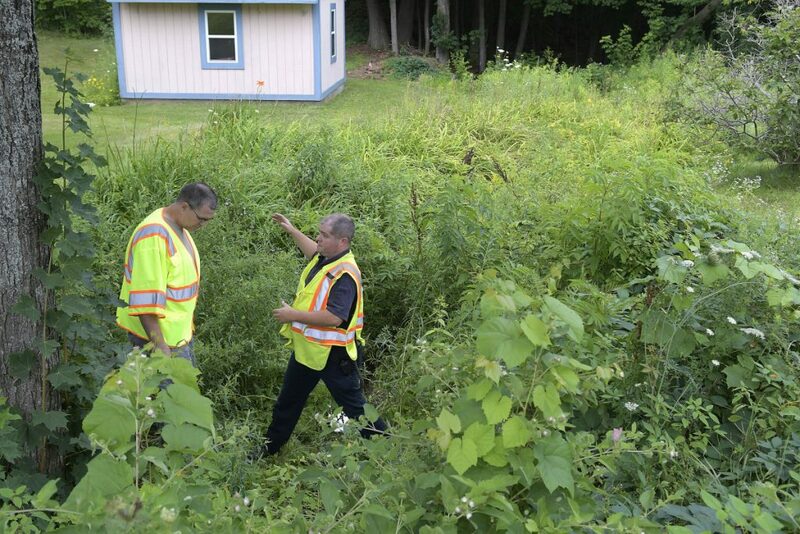 Nancy Morse, the owner of nearby property at 660 Riverside Drive, said landscaper Dan Albert, of Albert’s Plowing and Lawn Care, discovered the spill late Monday afternoon while working on her lawn. “He smelled it, told me about it and then I called the Fire Department,” she said in a Wednesday phone call. Morse said the spill flowed downhill and through a drain under the street to her land and eventually into a small drainage ditch. Morse said she was unsure if the ditch led to another body of water, but she was still concerned about animals coming into contact with the oil. The Internal Revenue Service (IRS) requires heating oil and some other oils not for highway use to be colored with a red dye. The red color signifies exemption from federal, state and local taxes applied to fuels sold for use on public roads. Morse said she was thankful the spill happened during the summer, when it was easily detectable, compared to when snow is on the ground.